SHIFTboston blog» Blog Archive » A Day on the Hubway! Susan Yoo and Kim Poliquin of SHIFTboston spent the day trying out the new Hubway bike share system in Boston. From South Station to Back Bay through the Fens to Downtown Crossing and out to the dry docks they interviewed other Hubway riders and observed the system. Here is what they have to say. How much does it cost? It is $60.00 a year for a membership, which gives you access to the bikes anytime all year round. There is a usage fee which is based on the amount of time you have the bike. The usage fee ranges from 2.00 for an hour up to 100.00 for 24 hours. 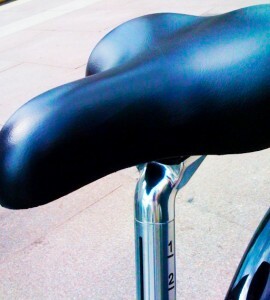 It is FREE to ride the bike for only 30 minutes. There is a self-serve kiosk at each of the bike hubs. All you need to do is enter your credit card and the machine will give you a code. Enter the code in any available bike slot and off you go. Bikes can be returned to ANY location. Where are the bike hubs? The hubs are located in a number of high-traffic locations and transportation centers around the city such as North and South Stations and Copley Square. 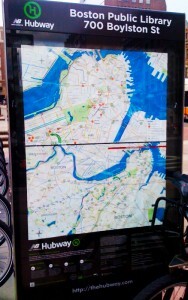 There is a map at every hub which identifies all of the hub locations in the city – in addition to locations where one can purchase a bike helmet. The hubway kiosks are powered by solar energy. The bikes are also equipped with safety lights for night travel. 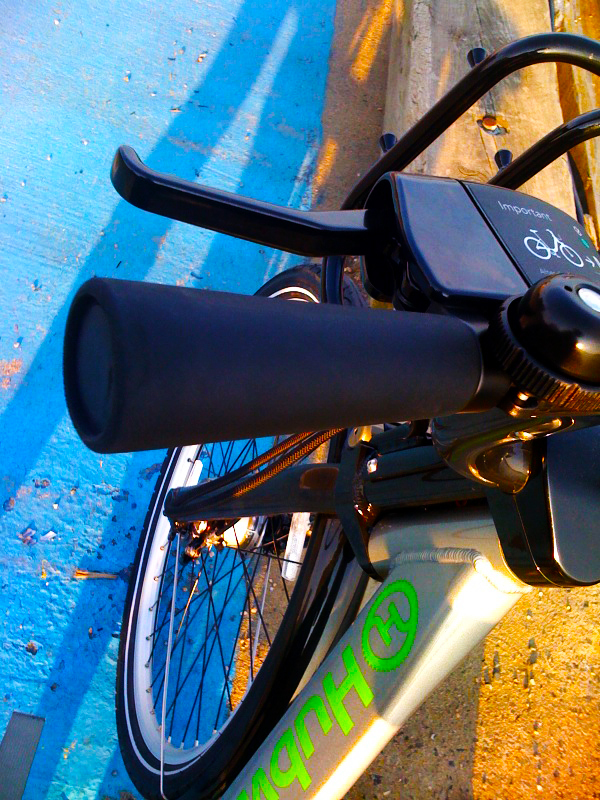 These lights are powered by a battery which collects energy from the humans pedaling the bike. More comfortable than my mountain bike. The seats are soft on the rump and very easy to adjust….just look at that seat. 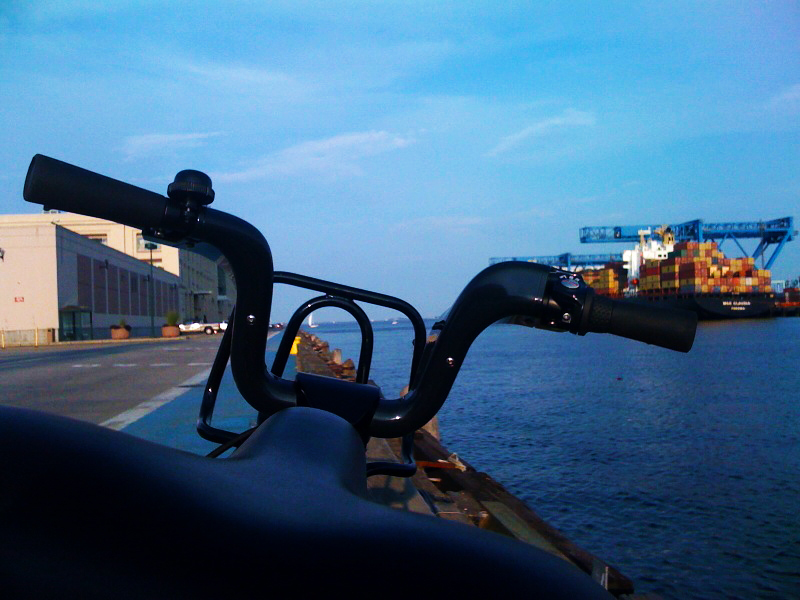 The handle bars are also have a large, soft comfortable grip. The tires are also well sized for jumping city curbs. The scariest street to ride. Boylston Street during the afternoon was a white knuckle experience. It is such a crowded, fast moving street lined with double parked cars and large trucks, doors seem to always be opening abrubtly. There is no room for bikes. Next time I will stick to Commonwealth which has a well marked bike lane. I recommend the ride out to the dry docks in South Boston. It was by far the best part of my day. 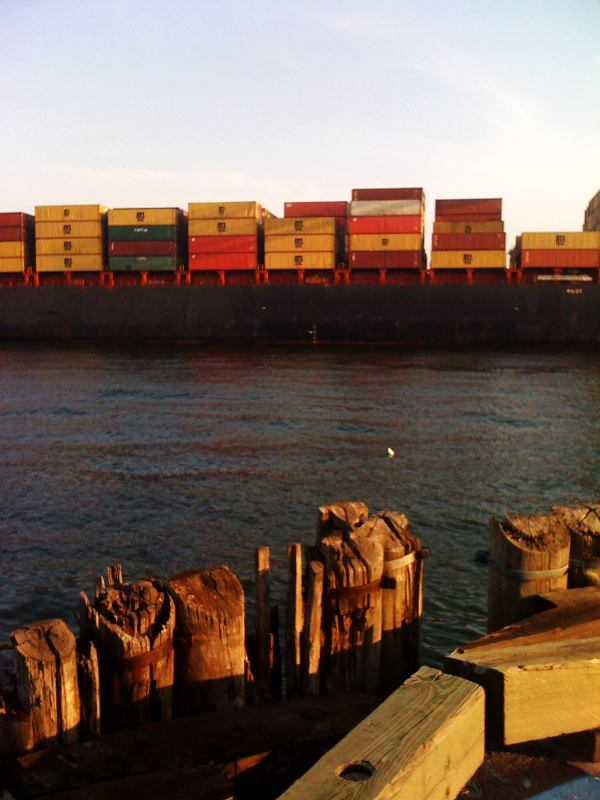 Spectacular views of the harbor and its industry. Nothing comes close to watching plane belly’s lift if you like that kind of action. And bring your fishing rod along – while passing through I saw someone reeling in a large striped bass…. If you plan to use the bikes all day — be prepared — you may need your walking shoes. One problem I noticed with the Hubway system is that many of the hubs actually run out of bikes during the commuting hours. Around 4:30 I was stranded in Downtown Crossing after leaving my bike at a hub that got stripped in the 20 minutes it took me to eat my sandwich a Chacarero. Government Center was also empty at 5:00 I walked for quite a while before I found another bike. The problem seems to be bikes downtown empty out quickly by commuters who ride them to – and leave them at — major transportation hubs and closer to neighborhoods. Fortunately, there is a mobile device application which keeps inventory of ALL hubs so that you know which one will have bikes available. And also where you can go to return a bike as you NEED to return it to an empty slot. I can imagine at 5:00 during the week ALL of the slots at South Station must be full. 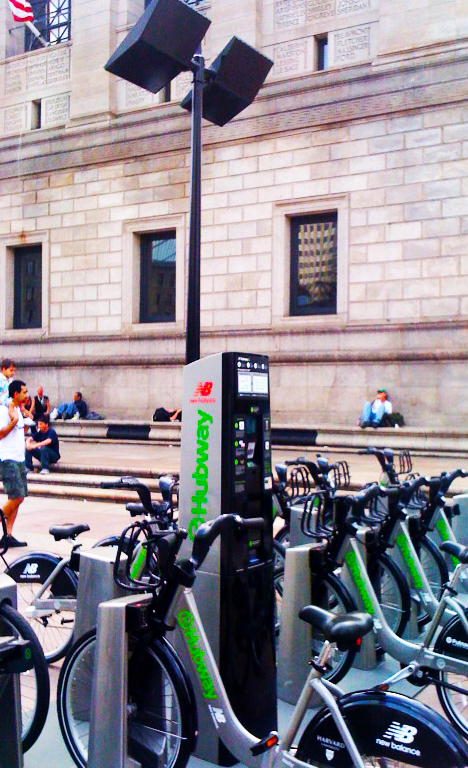 What are people saying about the Hubway? Capital Bikeshares in Washington has a van that rebalances bike supplies when the stations get stripped or over-stocked (I actually happened to be at an empty one on a DCD visit last spring when the van arrived). 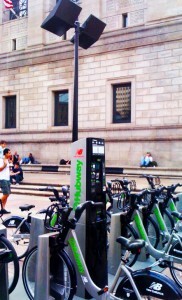 If Hubway isn’t rebalancing in this way, and you don’t say that they are, mobile apps can only provide limited help. Since the same company runs both Hubway and the DC system, I have to assume this is in the works, if not already part of the system, but…it would be great if you could check and report on that. Capital Bikeshares in Washington has vans that rebalance bike supplies when the stations get stripped or over-stocked. I actually happened to be at an empty one on a DC visit last spring when the van arrived, and boy, did it feel like a godsend. 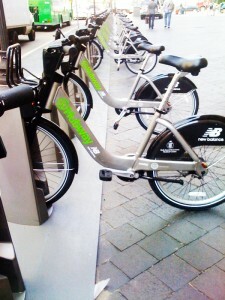 If Hubway isn’t rebalancing in this way (and you don’t say that they are), mobile apps can only provide limited help. Since the same company runs both Hubway and the DC system, I assume this is in the works, if not already policy, but…it would be great if you could check and report on that. I love the terms and conditions. 139 screens! Besides a helmet, the other missing item is a lock. I dont see carrying these items with me all the time, which will severely limit my ability to use Hubway spur of the moment, which walking and T offer. This is quite misleading, if not false information. The membership (i.e. being registered with Hubway and being able to rent bikes in the first place) and the fees for renting bikes are two different things. 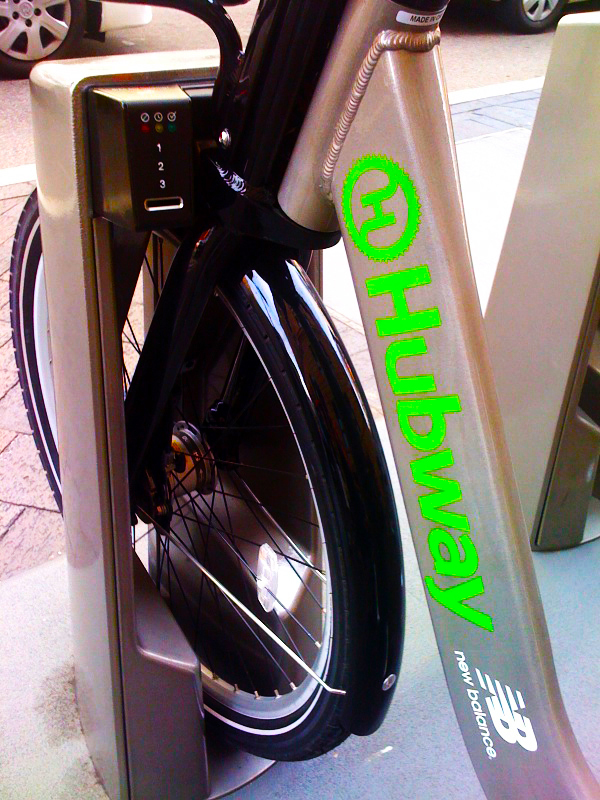 In order to use Hubway, you have to be a member, which costs $60/yr or $5/day. The rental fees are the same for casual and regular users: Any ride under 30 minutes is free, as soon as you go over half an hour of rental time, the price drastically increases. Hubway is a bike share, not a bike rent system, designed for point-to-point trips and a high number of rentals per bike and day. So if you sign up for a $5-24h-Membership, take out a bike in the morning and return in the evening, be prepared for a bill in the triple digits. And there are a lot of tourists in the city right now who don’t realize this and are in for a big surprise.